Just up the road from Florida, Gildshire lands in Georgia as State Number Three on our America the Beautiful Tour. With just over 10 million residents, Georgia ranks 8th in the United States in population. Georgia’s eastern border is the Atlantic Ocean. Its Northern border includes both South Carolina and Tennessee. To the West find Alabama and to the South lies the panhandle of Florida. Known as “The Peach State” Georgia is actually a world leader in three different “P” foods. The most peaches, pecans and peanuts in the world come out of Georgia and provided former president Jimmy Carter his livelihood before he went into politics. Like North Florida, the majority of the state of Georgia is primarily a humid subtropical climate. Hot, humid summers are the rule of thumb in the summer. Significant rainfall (45-70 inches) is experienced throughout the state. The geographic center of Georgia is about 17.5 miles southeast of Macon. We say “about” because the state legislatures of Georgia and Tennessee are currently in dispute over the exact border of their states. At stake, the waters of the Tennessee River. The University of Georgia is located in Athens. UGA was the first-ever state-financed college in the country. Wesleyan College in Macon was the first school in the world to grant degrees to women. The Cherokee Rose is the official state flower. Georgia is the largest State east of the Mississippi. Known as the sweetest onion in the world, the Vidalia can only be grown in the fields around Vidalia and Glennville. *Gildshire Note* Readers in Washington State just threw down their tablets and are writing letters in support of the Walla Walla Sweet Onion, as we speak. Cumberland Island, off Georgia’s eastern shore, is a popular resort and was the host of the wedding of John F. Kennedy and Jacqueline Lee Bouvier. Gainesville, Georgia calls itself “The Chicken Capital of the World.” It is illegal to eat chicken with a fork in Gainesville. Forest Park hosts the world’s largest Farmer’s Market. We’re going to start way up North in Sautee Nacoochie where we will visit the Folk Pottery Museum of Northeast Georgia. This museum describes folk pottery making in the area and has some beautiful examples. Later, just 14 miles down Old Highway 384 find Stovall Mill. Choose from walking over the swinging bridges or zip lining through the trees. You may surprise yourself and find the zip line an easier trip. Southwest on The Cleveland Hwy. (255 on the map) for a little less than an hour, we find our destination for the first night of this peaceful journey. Lake Lanier was the host water for the 1996 Summer Olympic games which called Atlanta home. You arrived her by mid-afternoon. Treat yourself to a dinner cruise on the Island Queen excursion yacht. Stay the night at The Country Inn and Suites for $99/night. It is just eight miles from the lake. Or splurge at Lanier Islands Legacy Lodge for $159/night. The first part of the next day will take us to Tallulah Gorge. Often called The Niagara of the South, the gorge is two miles long and over 1,000 feet deep. “Waterfall” is the theme of our day, because after Talulah Gorge we are going 70 miles West to 790 foot Amicalola Falls. The hiking, sightseeing and picture taking of the day will leave us a little leg-weary and ready to call it a night at Dawson Village Inn. Rooms from $70/night. Now it’s time to put some mileage on the tires. Every day has been an easy drive so far. Now we’re going to Atlanta! First we’re going to visit the famous Fox Theater. The Fox has hosted all of the great acts. It doesn’t matter who is appearing. Just go. The next day you’ll want to visit the gardens at Piedmont Park and the Atlanta aquarium. Both are world class. Finally, Atlanta host all four major sports as well as NASCAR. Pick a sport and a venue and go! Stay at the Ramada Plaza Capitol Park for $79/night. A reasonable rate for a downtown hotel and you’ll need it for three nights. Then we’re off to the ocean shores. 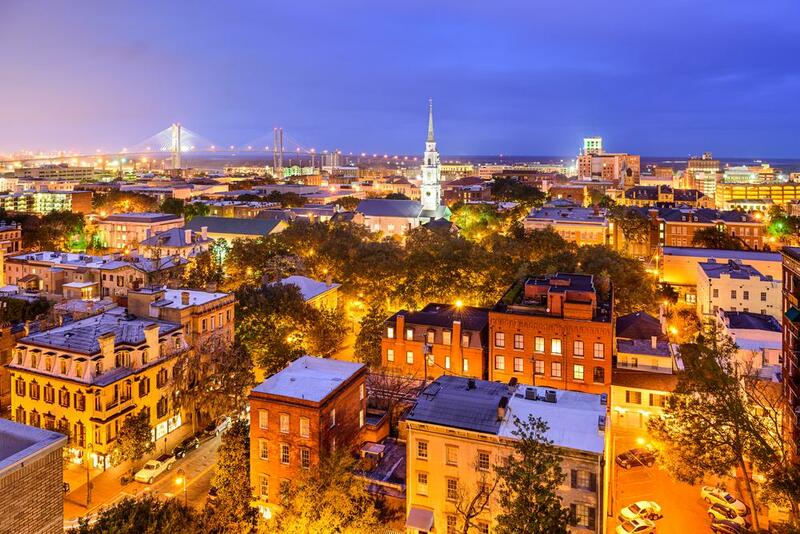 Savannah is our destination and Gildshire’s pick if you only have time for one night in Georgia. This is the South you think about when the word “antebellum” comes to mind. The leafy trees which line the streets provide a comfortable canopy even when the days are warm. Savannah is best seen on foot. Gildshire likes “Savannah Dan’s Walking Tour” for the great history of the area and some tips for the best restaurants at which to dine. The next day will be a walk on the beaches of lush East Georgia, which will lead up to an experience unique. The Afterlife Tour examines evidence of the paranormal, debunks some popular myths, and then shows you some things you won’t be able to explain away! Stay two nights at The Oglethorpe Inn and Suites. Rooms from $69/night. It will be a great week in the State of Georgia. Next up, Sweet Home Alabama!